With the theme “re-cycle, re-use, re-sist,” the Shangri La Field at Glastonbury Festival 2017 drew eager crowds to its rubbish-as-refuge model. A gas tower symbolizing a bygone industrial era loomed over the site and served as the epicenter of the digital revolution with support from d3 Technologies. The gas tower, which included projection mapping on all eight faces, was the focus of what the festival called “360-degrees of awe-inspiring audio visual action.” The immersive video installation showcased artwork, AV performances, VJs, and other musical acts. According to Nick Diacre of ddl design, a specialized software and 3D modeling company, d3 was chosen for its versatility in playback and capture. The install utilized two d3 2x4pro media servers, and one 2x2plus media server. 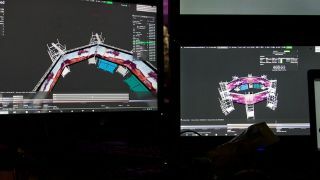 Diacre stated the team needed the ability to rapidly create multiple mappings across the canvas and quickly switch between cues. Critical to the project was stability, as the system needed to run 24/7 for five days with no glitches. “We were also looking for outstanding interoperability and show control, making sure we could build control systems that integrated with other hardware on stage, including video matrices, projection, and lighting,” Diacre said.